A growing network of lakes on the Greenland ice sheet has been found to drain in a chain reaction that speeds up the flow of the ice sheet, threatening its stability. Researchers from the UK, Norway, US and Sweden have used a combination of 3D computer modelling and real-world observations to show the previously unknown, yet profound dynamic consequences tied to a growing number of lakes forming on the Greenland ice sheet. Lakes form on the surface of the Greenland ice sheet each summer as the weather warms. Many exist for weeks or months, but drain in just a few hours through more than a kilometre of ice, transferring huge quantities of water and heat to the base of the ice sheet. The affected areas include sensitive regions of the ice sheet interior where the impact on ice flow is potentially large. Previously, it had been thought that these 'drainage events' were isolated incidents, but the new research, led by the University of Cambridge, shows that the lakes form a massive network and become increasingly interconnected as the weather warms. When one lake drains, the water quickly spreads under the ice sheet, which responds by flowing faster. The faster flow opens new fractures on the surface and these fractures act as conduits for the drainage of other lakes. This starts a chain reaction that can drain many other lakes, some as far as 80 kilometres away. These cascading events – including one case where 124 lakes drained in just five days – can temporarily accelerate ice flow by as much as 400%, which makes the ice sheet less stable, and increases the rate of associated sea level rise. The results are reported in the journal Nature Communications. The study demonstrates how forces within the ice sheet can change abruptly from one day to the next, causing solid ice to fracture suddenly. The model developed by the international team shows that lakes forming in stable areas of the ice sheet drain when fractures open in response to a high tensile shock force acting along drainage paths of water flowing beneath the ice sheet when other lakes drain far away. 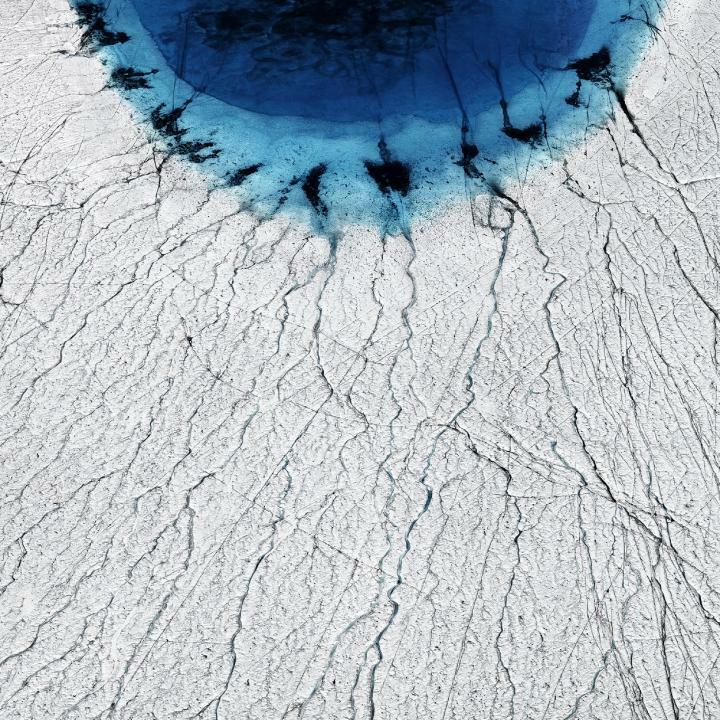 "This growing network of melt lakes, which currently extends more than 100 kilometres inland and reaches elevations as high a 2,000 metres above sea level, poses a threat for the long-term stability of the Greenland ice sheet," said lead author Dr Poul Christoffersen, from Cambridge's Scott Polar Research Institute. "This ice sheet, which covers 1.7 million square kilometres, was relatively stable 25 years ago, but now loses one billion tonnes of ice every day. This causes one millimetre of global sea level rise per year, a rate which is much faster than what was predicted only a few years ago." The study departs from the current consensus that lakes forming at high elevations on the Greenland ice sheet have only a limited potential to influence the flow of ice sheet as climate warms. Whereas the latest report by Intergovernmental Panel on Climate Change concluded that surface meltwater, although abundant, does not impact the flow of the ice sheet, the study suggests that meltwater delivered to the base of the ice sheet through draining lakes in fact drives episodes of sustained acceleration extending much farther onto the interior of the ice sheet than previously thought. "Transfer of water and heat from surface to the bed can escalate extremely rapidly due to a chain reaction," said Christoffersen. "In one case we found all but one of 59 observed lakes drained in a single cascading event. Most of the melt lakes drain in this dynamic way." Although the delivery of small amounts of meltwater to the base of the ice sheet only increases the ice sheet's flow locally, the study shows that the response of the ice sheet can intensify through knock-on effects. "The transformation of forces within the ice sheet when lakes drain is sudden and dramatic," said co-author Dr Marion Bougamont, also from the Scott Polar Research Institute. "Lakes that drain in one area produce fractures that cause more lakes to drain somewhere elsewhere. It all adds up when you look at the pathways of water underneath the ice." The study used high-resolution satellite images to confirm that fractures on the surface of the ice sheet open up when cascading lake drainage occurs. "This aspect of our work is quite worrying," said Christoffersen. "We found clear evidence of these crevasses at 1,800 metres above sea level and as far 135 kilometres inland from the ice margin. This is much farther inland than previously considered possible." While complete loss of all ice in Greenland remains extremely unlikely this century, the highly dynamic manner in which the ice sheet responds to Earth's changing climate clearly underscores the urgent need for a global agreement that will reduce the emission of greenhouse gases. The work was funded by the Natural Environment Research Council (NERC) and the European Research Council (ERC).